DPA Plastering & Building Maintenance - Painter/Decorator, Plasterer based in Ashford, Kent. 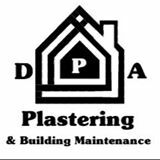 Welcome To DPA Plastering & Building Maintenance. I am here to help with all you’re plastering and painting needs. I promise to offer you clean, professional and reliable, affordable service every time. I take pride in all my work. I will meet my customer's high standards as a minimum as customer satisfaction is my priority. I have over 10 years’ experience in plastering and painting. I'm pleased to offer free no obligation quotes and advice. I'm fully insured. - All aspects of plastering. - All aspects of internal/external painting.